TravelVisa.com invites you to the 21st Century. Getting travel documents can often seem like an outdated endeavor left over from a bygone era. Unlike other visa services, our state-of-the-art technology and platform makes the visa application process simple and painless, no matter where you’re traveling to or from. Our website seamlessly guides you through the entire application process. Simply begin by selecting your destination, dates of travel and type of visa required. Once you’ve selected and purchased your travel visa you’ll be directed to govWorks.com where you’ll create a govWorks account to complete your visa application order. 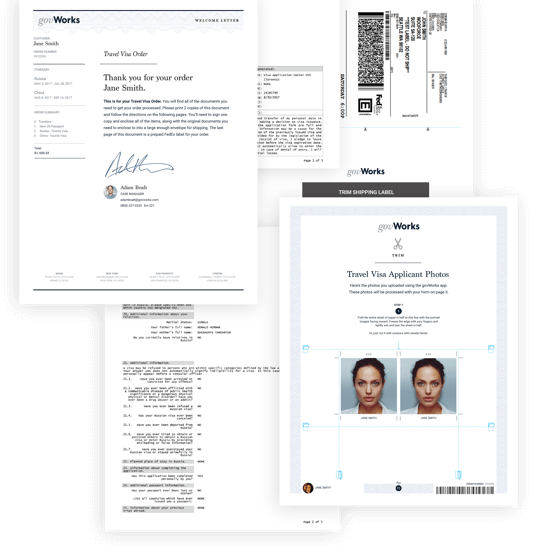 You’ll find govWorks super easy to use because we’ve eliminated the bureaucracy of government application processes by utilizing consumer-friendly best practices along with innovative technology. Our platform allows customers to create a Traveler Profile that enables them to seamlessly move across our family of websites with one sign-in. Easily create your Traveler Profile to manage your visa application. As you populate your profile all the information is stored, making subsequent orders up to 90% faster. We use the highest standards for credit card transactions and information security. Our system saves all personal information into a digital vault, that is a secure, centralized identity repository. As you manage your visa application and travel itinerary you can invite new people to join your travel group. You can even track the progress of group members as they proceed through the application process. Our smart online Wizard walks you through each step of the process, ensuring every “i” is dotted and “t” is crossed. By deconstructing the visa requirements for every country in the world, there’s very little for you to worry about. Just tell us where you're going and your nationality, and our system will then provide you with all the requirements and forms. How easy is that?! You’ll never have to second guess whether you’ve properly filled out your visa application. Our intuitive govWorks platform helps travelers electronically fill out all the appropriate documentation for each country on their itinerary, eliminating error-prone handwritten forms. Once you’ve completed the online visa application process, simply download, sign and print your packet for shipping. We can even schedule a FedEx pick-up. Track the progress and whereabouts of your visa application packet every step of the way using your computer or mobile device. We can even send you push notifications, emails, or text messages to alert you about the status of your visa application. We understand that security is extremely important to you. Rest assured, protecting your privacy is our top priority. Our family of applications all utilize government standards for information security and encryption to ensure the highest level of security for your private data. Our unbiased approach ensures that all of our customers get the same level of security, no matter their country of origin. If you’d like to learn more about our technology solutions.